As we mentioned earlier, April is National Poetry Month in the US, and we’ve borrowed the idea because we rather like poetry. Later in the week we hope to have a real live poet visiting the blog, so be sure to check back! 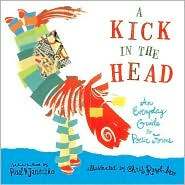 In the meantime, here is a fantastic book by Paul B. Janeczko (illustrated by Chris Raschka). Next Post Coming Thursday – children’s poet, Jackie Hosking!